The energy and beauty of an untamed horse is captured perfectly by Delacroix. 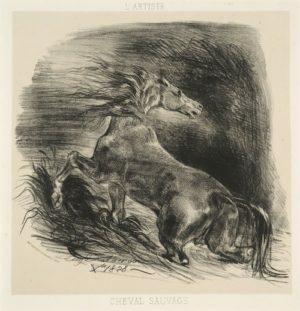 The versatile technique of lithography accurately describes the texture of the horse’s coat and the momentary nature of this scene shown through the animal’s frightened response to a gust of wind. It dates from a time when there was a great interest in wild animals and their primal instincts. Delacroix was heavily influenced by George Stubbs (1724-1806) whose studies of horses from life would have been on show during Delacroix’s visit to London in 1825.